Around here, folks guard their morel-hunting grounds with as much secrecy (though less firepower) than they use on their moonshine stills. I distinctly remember a friend of mine telling me about the bags of morels ("dry land fish") he hauled out of the woods one spring, adding that there were so many present that he left behind over half of the mushrooms. "Where are they?" I asked naively. "I'd love to gather some morels." "Oh, up that holler there aways," he said vaguely, pointing his chin toward two or three valleys in the distance. Mark's friendships are obviously stronger than mine. 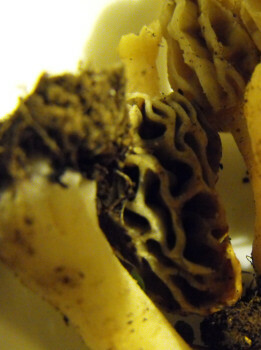 He came home on Monday with a little mess of morels which he and his friend had gathered together. 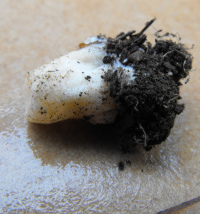 I was ecstatic because I'd been dying to try out my mushroom cultivation techniques, and now I have the raw material to do it. I cut the stem butts off and slapped them between wet cardboard. Another fun experiment!